TOKYO–(BUSINESS WIRE)–On April 20th, 2017 (Thu.) 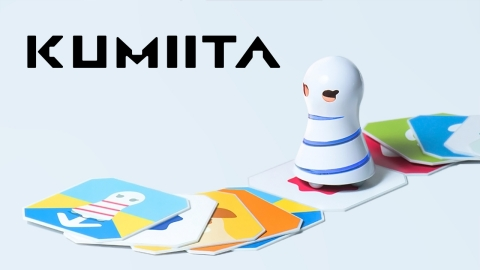 ICON Corp. will begin a crowdfunding campaign for KUMIITA, an educational toy designed for 0 to 3 year olds to teach them the concepts of programming. Kickstarter project page at https://goo.gl/MLkbjM. By providing a language-less and hands-on experience in the form of a puzzle game, children will be accustomed to programming from a young age. KUMIITA cultivates the basic thinking patterns and logic behind programming in children by allowing them to physically assemble command panels and see how the resulting programs are executed – and why they fail at times, as well. Failed programs can also be fixed by rearranging the panels in various ways, allowing children to figure out new solutions for themselves. KUMIITA is played by placing down panels which the robot will roll over, following its path ahead. The robot scans each panel and executes different commands to change its color or direction, play a musical instrument, or make animal sounds. Through cultivating a rich culture of product development that has led us to solutions for searchable, encryption protected data systems, ICON Corp. will soon reach the 20th anniversary of our founding. The KUMIITA project represents a confluence of technical expertise and free thinking to realize the development, introduction, and furthering of new ideas under the banner of „well-being through technology“ that we have strived for since our inception. To realize a prosperous future through technology, we have taken a stance of total integration, to include not only our programming software, but hardware products and services. And now we are venturing to build opportunities for children so that they may enjoy programming in the effort to accelerate the creation of new ideas, and value that will ultimately carry the future forward. The Kickstarter campaign will run from April 20th through May 20th with a project funding goal of $30,000. For full details concerning the campaign including pledge rewards, please see our project page at https://goo.gl/MLkbjM. Dieser Eintrag wurde veröffentlicht in Crowdfunding, Development, English, General, Hardware und verschlagwortet mit Infant, Robot, Toddlers von Sebastian Trella. Permanenter Link zum Eintrag.